Once your artwork has been properly framed, you’ll need to know how and where to hang your favorite pieces. Picture framing in Adelaide is a process that is simply incomplete without also planning out where and how you’re going to put up your works of art. Here’s our 5-step guide to doing it yourself. Every room in the house has its own advantages, architectural niches, and areas of open light. Before you put nails in the wall, take some time to review where you’d like your pieces to go and what feeing each artwork will bring. If you’re using multiple smaller pieces in a group or cluster on one wall, planning is especially important. When you’re considering where Artwork looks good, you’ll always be looking at a space in the context of your decor and home furnishings, as well as architectural additions like mantels, columns, archways, and more. Most of the time, people end up hanging their artwork far too high. When in doubt, hang it a little lower than you might care to. This way, it will be a part of the room. The rest of the positioning and the choice of what to hang where should be based on what you feel looks good. For hallways, stairways, alcoves or any other spaces where you don’t have regular furniture, you’ll need to hang pieces about 1.5 meters from the floor. If you’re stacking two art pieces on top of each other, you should keep this distance from the floor to the first piece but create a five-centimeter space between the edges of the two frames. When you’re looking around for inspiration on how to group your artwork or wall-hangings, you’ll likely see many interior decorators arranging art pieces in a certain way. This might include the artworks grouped together in a triangle or flowing out from a point, almost like a stream. To get that same effect, lay your artworks on the floor and start to tile them together so that they ‘fit’. Alternate between large and small pieces and give them an order, almost as though you’re creating a flat lay. Next, take the height and width measurements of each artwork, with the frame, and mark the outermost points on the wall using painter’s tape. This helps you create guidance points. You can start hanging from here. Grouping your paintings or artworks in this irregular way means you’ll also have to be prepared for some irregularity in distances between the edges of frames. Even if they can’t all be a perfect five centimeters, it’s fine. Allow the artwork you’re hanging to be the focal point of your decisions on where to hang them. Instead of lining up your piece with the height of a sofa or a mantel, choose to give a particularly interesting artwork its own horizon line. If you have a darker and moodier piece, this can automatically bring more gravitas and weight to a room. In this case, either keep the piece by itself or position it as the highest focal point in a group of paintings so it doesn’t weigh the room down entirely by dragging the eye down. In fact, it’s best to keep more than a few walls bare. Whether it’s a light artwork or something more impactful and textured, don’t underestimate the levity and cohesiveness that a negative space like a blank wall can bring to a room — and to your artwork. 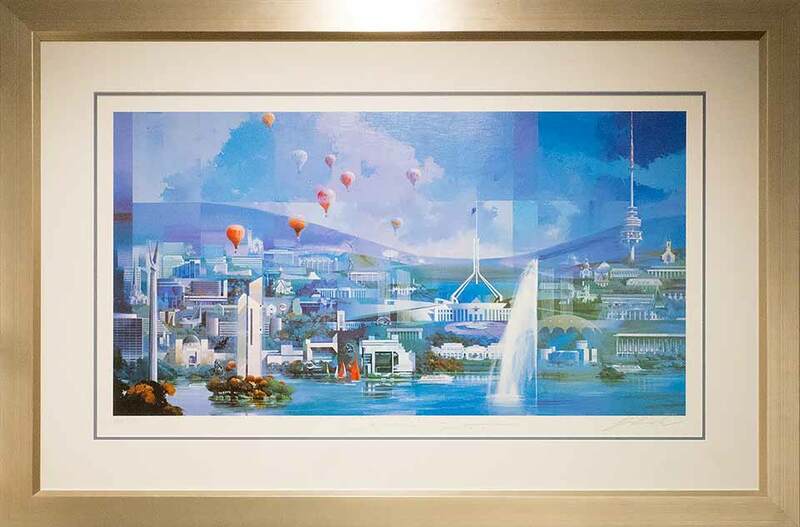 Art & Frame offers our clients Elite Picture Framing Services in Adelaide that come backed with our years of expertise and knowledge in the art and decorator world. Whether you’re a notable collector with an eye for the fantastic or a new connoisseur who’s only just starting your burgeoning collection, visit our framing experts, and we can guide both your framing and hanging decisions.